In light of the court ruling to permit an autopsy on the chareidi infant who died as a result of an accident in the Miami Hotel in Ashdod, the call has been issued to protest. An Ashkelon Court on Tuesday approved a police request for an autopsy on the four-week-old boy to determine cause of death, but also agreed the autopsy would be held up pending an appeal by the family and ZAKA to the High Court of Justice. 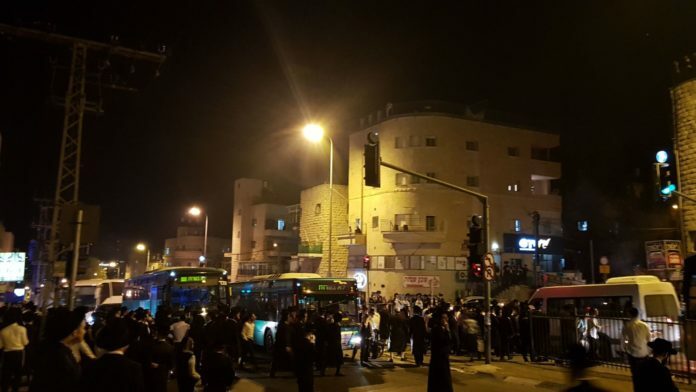 Protesters have been instructed to leave their shtreimals at home and to wear everyday shoes as police water cannons are spraying the ‘skunk water’ as it is known. The mom remains in jail and the court has approved holding the father in jail until Sunday as the investigation continues. There is a gag order on most details, but police believe the mother killed the child and the father knowingly interfered with the investigation. The mother allegedly dunked the child in the jacuzzi four times until he died. The mom told police of a “divine vision” that took place and she believed the child left the water by himself due to divine power. Defense attorney Shani Fergon is asking to have the mother sent for psychiatric evaluation. She explains the couple is 28-years-old and they have a 7-year-old child at home. These protesters are low life baalei aveiroh, just looking for an excuse to let go and release their personal yestzer horah on others. They should be arrested and held for a substantial amount of time. There is indication of serious responsibility, and the parents are in a position of liability. The police and court are not on an anti-chareidi witchhunt. There is a dead child, and the suggested evidence points to the parents as culprits. This protest is not a tiny bit holy or a mitzvah. These idiots should be learning Torah and using Pesach for its intended purpose. These degenerates are hiding behind Torah, which will eventually be the arm of their punishment. I understand the opposition to the autopsy, as there are ways to obtain much of the needed information without it. Yet, I won’t excuse the protests for that either. I hope they get arrested and detained for a long time. It’s quite possible that the police are the ones following the halacha in this situation. This is why EY has a court system that will decide. In matters such as these, they always seek the advice of the religious ministry, ZAKA’s expertise and other views but ultimately, if there is any doubt as to possible criminal activity, an autopsy Is 100 percent necessary and the police should do whatever is needed to assure it happens on a timely basis without interference from these hoodlums. You would not think they are low lives if you know their history. The Israeli secularists have waged warfare against the Torah way of life and have tried uprooting it countless times. If the Chareidim would not have fought for the upkeep of their way of life, it would have long ago been lost. If your government threatened your physical life you would all understand that violent protests are justified. You are only calling them lowlives because your spirituality isn’t as dear to you as your physical life, but to these holy Jews it is. Why do you side with the police to assume a crime? When was the last time you heard of a Charedi mother who murdered her child? And in the raging hafganos in the 70s which Rav Shteinman Zatzal said it’s a chiyuv to participate in, the stories were similar. The parents were accused of a crime. In Nazi Germany every Jew that was murdered was also “accused of a crime”. What kind of stupid mentality is this? ?